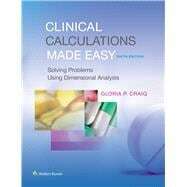 Clinical Calculations Made Easy includes a review of basic math skills, measurement systems, and drug calculations/preparations using dimensional analysis. The sixth edition provides many opportunities for students to practice their skills. Additional practice problems further strengthen the student’s dosage calculations skills while new information related to vaccines has been added with tables for administering vaccines to adults and children. In addition, there are practice problems related to the tables to help students understand how to use these types of tables effectively.